Crooked Lane Books, 9781683317203, 336pp. 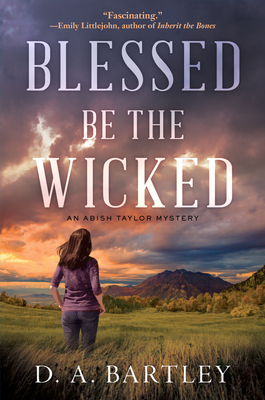 In D. A. Bartley's compelling debut, Detective Abish Taylor returns home to Utah and uncovers dark secrets lurking within the quiet Mormon community. Detective Abish Taylor left Utah for a reason. But with her husband's passing, it's time to come home. Reconnecting with her family means dealing with her past: the father she abandoned and the community she left behind. Her one escape is serving as the sole police detective in the small town of Pleasant View. But when the quiet Mormon suburb in the Wasatch Mountains is shaken by a macabre death--with the hallmarks of a sacred ritual dating back to the days of Brigham Young-- Abbie is called into action. As she uncovers the dark side of the picturesque neighborhood--infidelity, corruption, and the greed of a global religion--Abbie discovers just how far some powerful leaders of the Church will go to bury their secrets. Especially as the brutal murder unearths a sinister tradition lurking in the religion's not-so-distant past: the ultimate sacrifice for unforgivable sins. With the chief pressuring her to close the case and the community that once sheltered her watching her every move, Abbie must find justice for the dead--before she's silenced for good. D. A. Bartley is a member of Daughters of Utah Pioneers. She traces her family history back to the earliest days of the Church of Jesus Christ of Latter-day Saints. She spent much of her childhood in Utah, but her parents were incurable travelers. She was born in Scotland and lived in Germany, France and Russia. After studying international relations, politics and law, D. A. worked both as an attorney and an academic in Manhattan. In the end, though, she could not escape her life-long love of mysteries. She lives in New York City with her husband, daughter and son.